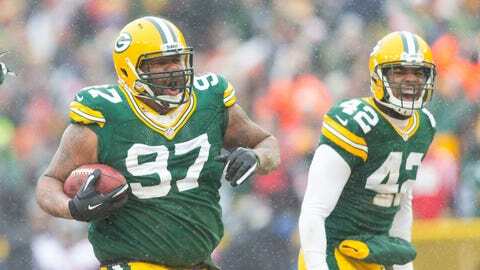 In 2013, Green Bay defensive lineman Johnny Jolly (left) recorded 21 tackles, one sack, three quarterback hurries and five tackles for loss in 13 games played. FOX Sports Wisconsin’s Paul Imig gives an in-depth statistical analysis and film study of every Packers player in his annual offseason checkup. Check every weekday through mid-April for his latest report. Looking live: Two years ago, Jolly was still in the very early stages of a six-year prison sentence. One year ago, after being granted shock probation and getting released from prison, Jolly was reinstated by the NFL after being away from football for three years. The Packers decided to welcome Jolly back into the family after restructuring his contract from $2.5 million (the amount he would have been owed in 2010 if not for the indefinite suspension) down to $715,000 if he made the active roster. For the first time in three years, Jolly put on his Packers uniform on June 4, 2013 for a minicamp practice. When training camp began, Jolly was fairly quiet early on. Part of the reason for that is because he wasn’t nearly in the same shape as the vast majority of his teammates. Jolly had to leave practice early a couple times, once for an ankle injury and another time with cramping issues, but neither kept him off the field for more than one day. In Green Bay’s second preseason game, Jolly played very well, batting a pass into the air that was intercepted and later having an interception of his own. The reaction of his teammates after those plays made it clear just how much everyone was pulling for him in his comeback attempt. Jolly followed up that performance with a great practice two days later, batting two more passes down. In the final preseason game, Jolly recorded a sack, two quarterback hits and had yet another batted pass at the line of scrimmage. Upon further review: Jolly completed his improbable comeback by making the Packers’ active roster. By that point, it was of little surprise that Green Bay’s defense wanted to keep Jolly around after the impressive preseason that he had put together. Throughout the regular season, Jolly’s playing time fluctuated between 22 percent of defensive snaps to 55 percent. He didn’t have nearly as many memorable moments in the regular season as he did in preseason, though. The Jolly Specialty (a batted pass) only happened once in the 137 passing plays that he was on the field for. He didn’t provide a ton of pressure on quarterbacks, hurrying the QB on 2.2 percent of passing downs. In the run game, he was much more effective, tying for second on the team with five tackles for loss. The two players ahead of him in that category (A.J. Hawk and Brad Jones) played significantly more than he did, as did the player he was tied with for second (Mike Neal). Looking at his dominant performance against the Falcons in Week 14, Jolly picks up a fourth-quarter tackle for loss when he tosses aside Atlanta’s right guard and immediately wraps up running back Jason Snelling in the backfield. Earlier in that game, Jolly was lined up over the left tackle when he quickly got to the inside and dragged down Steven Jackson. Status for 2014: Thirty percent chance of being on the Packers’ active roster to begin the 2014 season. Jolly has several factors working against him this offseason as it relates to remaining with Green Bay. He’s an unrestricted free agent, and with general manager Ted Thompson having a total of 17 unrestricted free agents to look at, Jolly won’t be a priority. Also, he’s recovering from neck surgery, the same one (C5-C6 fusion) that safety Sean Richardson had that kept him out for the entire first half of the 2013 season. Lastly, Jolly is 31 years old, and any Packers player over 30 had better be of incredible value to the team to feel safe. Coach Mike McCarthy has talked recently about wanting the defense to be more versatile in 2014, and that is not something that Jolly’s game is all about. Unless Jolly is medically cleared by training camp and accepts a one-year, veteran’s-minimum contract, it seems somewhat likely that his comeback in Green Bay was just a one-season deal.